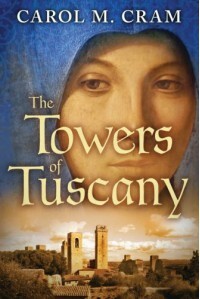 Carol M. Cram’s historical novel, The Towers of Tuscany, immerses her readers in an engrossing account of Italy’s medieval period in the 14th century. The main character, Sophia, is a talented painter who defies the rules of the land by disguising herself as a man in order to live out her artistic passion. Painting is taboo for women but she refuses to relinquish her dream. Besides the abundance of historical detail, the reader is privy to great description about the art of painting of the times. Sophia’s way of thinking has been nurtured by her beloved father’s controlling nature, and she constantly refers to his teachings throughout the novel. Being under her father’s thumb has blocked her from emotional growth and she repeated takes decisions that have a negative impact on her and those around her. There is no character arc for Sophia—she remains stunted within the boundaries of her art. As a reader I felt pretty jolted with the last part of the novel where the time period jumps a few hundred years and a brand new character is introduced.